After strong performances in a busy month there are eight players shortlisted for the EA Sports Player of the Month for December, for which the public can vote. Another impressive month for Chelsea means Diego Costa and Gary Cahill are nominated, Tottenham Hotspur’s rich vein of form has brought Christian Eriksen and Dele Alli to the fore, while Paul Pogba and Zlatan Ibrahimovic are nominated for helping spark Manchester United’s resurgence. With Liverpool enjoying another productive month Adam Lallana is nominated, and the outstanding displays of Alexis Sanchez have brought the Arsenal forward into contention. 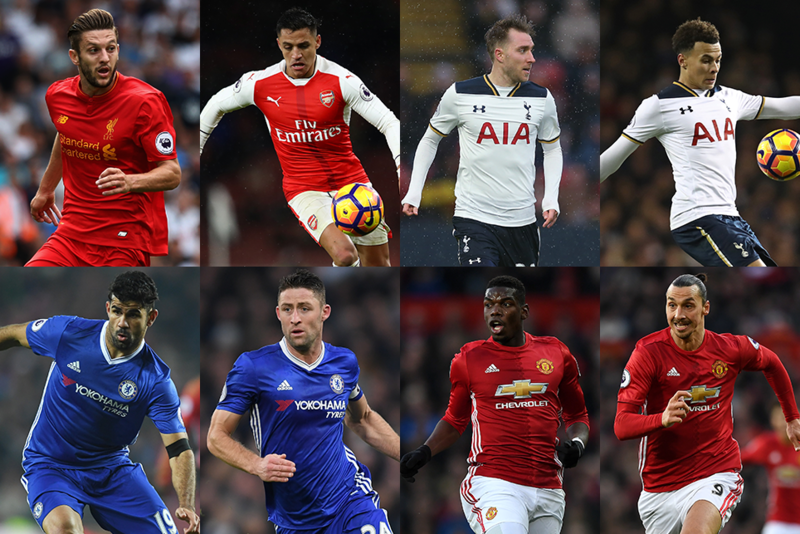 The EA SPORTS Player of the Month award is decided by a combination of a public vote via premierleague.com, counting for 10%, and those from a panel of Premier League experts and current club captains. The vote will close at 23.59 GMT on Monday, 9 January and the winner will be announced on Friday, 13 January. Lallana scored in the 2-2 draw with West Ham and was instrumental in the four victories that followed, with a brace against Middlesbrough, a goal in the 4-1 win over Stoke and two assists. Starting the month with a hat-trick in the 5-1 victory at West Ham United, Alexis Sanchez went on to get four goals and three assists in five matches during December. Only Diego Costa has more than his 13 PL goals this term. Christian Eriksen helped Tottenham Hotspur to four wins from five fixtures in December, netting twice apiece against Swansea City and Hull, as well as creating another two goals. The 20-year-old midfielder returned to the goals with an equaliser in a 2-1 home win over Burnley, before a brace at Southampton as Spurs finished December with four victories from five matches. Diego Costa scored four goals, including decisive strikes against Crystal Palace and West Bromwich Albion. The centre-back was ever-present as Chelsea claimed four clean sheets from their six victories in December. He also netted the opener in the 4-2 success against Stoke City. Manchester United only dropped two points in six December outings with Pogba at the heart of their midfield. The Frenchman scored in wins over Middlesbrough and Crystal Palace and also supplied two assists. Ibrahimovic took his tally to 50 league goals in 2016 with five strikes in six December fixtures. He netted the winner at Crystal Palace and also scored against Everton, West Brom and Sunderland.